Apple AirPods Vs Samsung Galaxy Buds: Which One Is Better? AirPods – Apple’s true wireless Bluetooth earbuds – have been around for almost two years. Last month, Apple’s biggest rival unveiled Galaxy Buds to take on the AirPods. Samsung’s new earbuds are jam-packed with exciting new technologies. Though they seamlessly integrate with the latest Galaxy S10 series phones, the Galaxy Buds are designed to work with a wide range of other products including the iPhones. Here we take a look at the AirPods vs Samsung Galaxy Buds comparison to see which one is better. The cases of both the AirPods and Galaxy Buds have a minimalist design and they both fit easily into your pocket. When Apple released the AirPods a couple of years ago, it drew some criticism for its goofy design. People began appreciating its design only after they started using it. The Galaxy Buds have a much sleeker design. Also, while the AirPods come in only white color option, you can get the Galaxy Buds in white, yellow, and black colors. The Galaxy Buds have an in-ear style design and come with three different sizes of wingtips that you can swap out to ensure the earbuds fit perfectly in your ears. The wingtips help keep the buds in place when you are jogging or working out. With the AirPods, Apple takes a one-size-fits-all approach, which means it might not fit everyone perfectly. It doesn’t mean the AirPods would fall out of your ears often. On the contrary, the AirPods drop out only in extremely rare instances. Neither AirPods nor the Galaxy Buds are splash-resistant. But the Galaxy Buds come with an IPX2 rating, meaning they can survive intense sweat sessions. Thanks to its design, the Galaxy Buds block out ambient noise more effectively than AirPods, which have an open design. They both are pretty easy to pair with the respective companies’ devices. You just have to open the case, bring the earbuds near your smartphone, and then tap to connect. 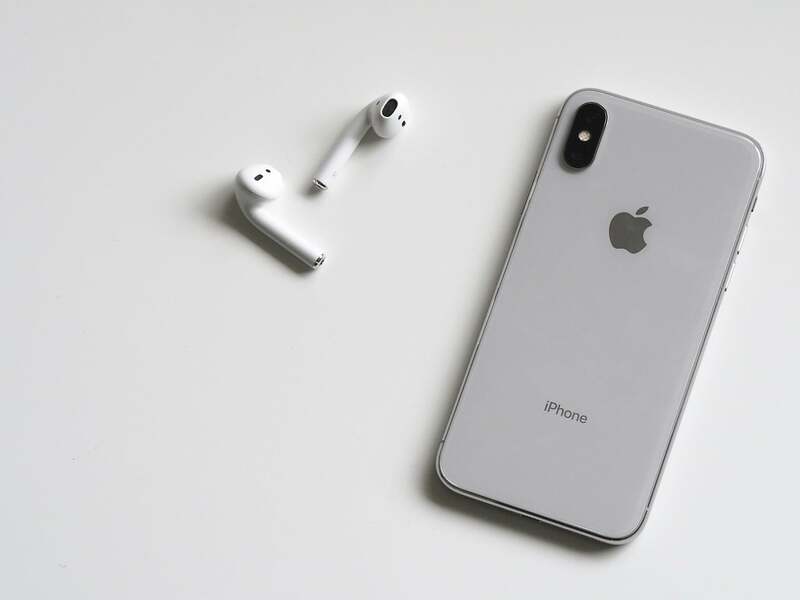 When you are using AirPods with your iPhone, you can easily switch them to your iPad or Mac if those devices are on the same Apple ID. Once you have paired the earbuds, you can tap to control music playback and calls on both of them. You can also summon the respective voice assistants Siri or Bixby. To customize the controls on AirPods, head over to Bluetooth settings on your iPhone and choose from the available options. If you are pairing Galaxy Buds with an Android device, you can use Samsung’s Galaxy Wear app to customize the controls. Samsung’s earbuds offer more controls including the ability to adjust the volume, tune the sound quality, and increase or decrease ambient noise. If you pair the Galaxy Buds with an iPhone, you’ll have to settle with the default controls. Samsung’s earbuds come with the latest Bluetooth 5 support, which ensures steady and reliable connectivity. There is no room for inconsistent audio and drop-outs. The AirPods come with Apple’s custom W1 chip, which has proved reliable. You can expect top-notch connectivity from both of them. But various range tests have shown that the AirPods have a longer range (distance away from the paired phone) than Galaxy Buds. This is the most important thing customers look for when buying a new set of wireless earbuds. AirPods are known to offer excellent audio, whether you are listening to music or are on a call. However, the AirPods have an open design, which allows for more ambient noise. So, if you are in a crowded place, you have to increase the volume to avoid hearing the ambient noise. The Galaxy Buds deliver better audio quality than AirPods, and they are also far better at preventing ambient noise. Samsung worked with AKG to tune the sound on Galaxy Buds. It also allows you to customize the audio profile to your liking via the Galaxy Wear app. But things are slightly different when you are on a call. The goofy design for which the AirPods were criticized at launch helps enhance the call quality. The beam-forming microphones are aimed towards your mouth to capture the sound of every word. The Galaxy Buds are also impressive, but they are not as good as the AirPods. During calls, the Galaxy Buds let both your voice and ambient noise in. Samsung claims its earbuds offer up to 13 hours of battery life – six hours from the earbuds and seven hours from the charging case. In contrast, the AirPods are supposed to last five hours between charges, plus another nine hours from the charging case, which is impressive. According to battery tests conducted by Cnet, Samsung’s earbuds offered about 7 hours of continuous playback while the AirPods delivered only five hours of playback. Since the AirPods case holds more charge, you can stay out and enjoy the music longer without having to worry about charging your earbuds. When it comes to recharging, the AirPods are noticeably faster. They offer up to three hours of playback in just 15 minutes of charging. By comparison, Samsung’s earbuds deliver only two hours of use in 15 minutes of charging. What’s exciting about the Galaxy Buds is that you could charge them by putting them on the back of your Galaxy S10, S10 Plus or Galaxy S10E. Samsung’s latest flagship smartphones support bi-directional wireless charging, and the Galaxy Buds case is designed to take advantage of that. Almost everyone who owns these earbuds fears losing them. But you can easily find them using your phone. The AirPods show their last location where they were paired on your iPhone. The Galaxy Buds don’t show their location. They only play a sound when you ping them. The AirPods come with a feature that pauses music when you take one of the pods out of your ear to talk to someone. The music starts playing again the moment you put it back. That’s an impressive feature. The Galaxy Buds offer something similar, but it works only when you remove both the buds. If you take out only one of them, the music continues to play on. Samsung’s earbuds cost $130, making them a little cheaper than $159 for AirPods. Also, you can charge the Galaxy Buds wirelessly. They also deliver better audio experience than AirPods. However, it’s quite surprising that the two years old AirPods have held their own against the latest Galaxy Buds. If the rumor mill is to be believed, Apple could launch the second-generation AirPods 2 pretty soon. The AirPods 2 could give the Galaxy Buds a run for the money.